Discussion in 'Contrails and Chemtrails' started by Mick West, Jul 4, 2014. Several tons of aluminum, barium, and strontium will be sprayed into the atmosphere tonight, the 4th of July, often in close vicinity to large crowds in people in large cities. Even small children will hold small devices that create clouds of nanoparticles of aluminum, barium, and strontium, and other heavy metals. I'm talking, of course, about fireworks. Those three elements are commonly referred to as being toxic elements that are sprayed in the "chemtrails" conspiracy theory. There is, of course, no real evidence that "chemtrails" are real. Yet the presence of aluminum, barium, and strontium in the environment (all three are naturally occurring, especially aluminum) is often pointed to as some evidence of spraying. Yet most people have no idea of how much of these elements should be found in the environment, or how much they are used in activities that they themselves have never though of as problematic. 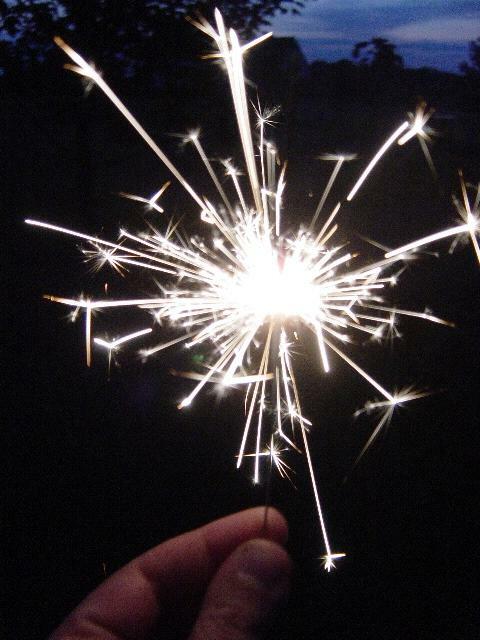 Even your kid's sparkler quite likely contains aluminum, and quite often barium or strontium. Sparklers mainly consist of a metal rod, or thin tube coated with an explosive mixture to burn, producing a shower of colorful sparks. Sparklers may be designed to be non-handheld or handheld (i.e., fixed to a support) (Russell, 2000). Their chemical composition can be described by four main components (McManus, 1975; Helmenstine, 2012): (1) A metallic component (e.g., aluminum, iron, titanium, zinc, magnesium powder or flakes), which is responsible for producing sparks; (2) An oxidizing component (e.g., potassium, barium or strontium nitrates, potassium chlorate, ammonium perchlorate); (3) A combustible binder, which holds the mixture together (e.g., dextrin, nitrocellulose, shellac, gum Arabic, or other sugars and resins); and (4) A fuel component (e.g., charcoal). Fine particulate matter, or PM2.5 (PM with AED < 2.5 μm), UFPs, and nanoparticles (NPs, PM with AED < 50 nm), emitted from sparklers, are mainly metallic in nature (Kulshrestha et al., 2004) and pose a threat to human health due to the abilities of UFP and NPs to deposit in all regions of the respiratory tract. And there's quite a lot. America burns 30,000 tons of fireworks per year. 20,000 of that will be burned today, on the 4th of July. Also, these "devices" (fireworks) are presented at, or nearly at, ground level. Unlike the false assumption of so-called "chem"trails, at several miles (at least) above ground. Where they are of course subjected to sometimes very high winds aloft, and also the natural fact that there is a huge amount of atmosphere, and thus there is a dilution effect (of course, "chem"trails are an Urban Legend, a myth and a hoax being perpetuated by some unscrupulous individuals, by playing upon some peoples' fears). 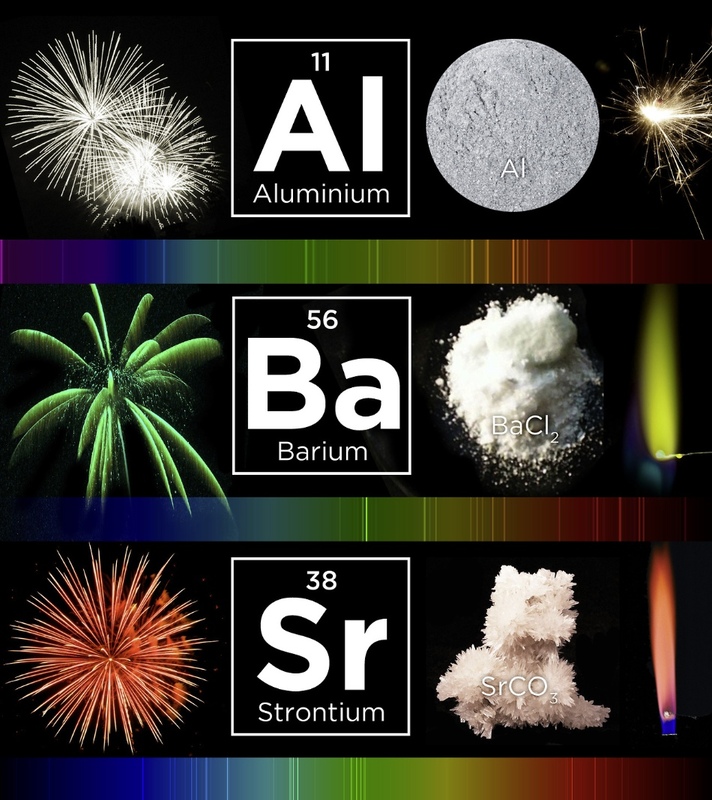 Another common metal in fireworks is lithium. This is also used by NASA in their upper atmosphere sounding rockets (basically giant fireworks). This prompted the idea that someone is spraying everyone with lithium to calm them down (Lithium is a mood-stabilizing drug). It's actually the same compound, lithium carbonate, used as both a firework ingredient, and the drug. Several tons of aluminum, barium, and strontium will be sprayed into the atmosphere tonight, the 4th of July,...there's quite a lot. America burns 30,000 tons of fireworks per year. 20,000 of that will be burned today, on the 4th of July. Good to know! I will be sure to wear my face mask tonight! Happy 4th those who care to celebrate. Beer, Burgers and Barium- sounds like a party. I have to work.... (sad face... ). I think that 30,000 tons of annual firework consumption is a useful figure. If 20,000 tons of that stuff is being released into the sky at very very low altitudes and close proximity to humans compared to chemtrails, and basically no one experiences any sort of poisoning as a result of these elements released into the air, how is it going to do anything at all from such a high altitude with uncontrollable winds? It also gives you an idea of the massive amount of materials that would be needed to poison the population from that high. If 20,000 tons on one day near a large number of people all over the country has no effect, how much of this stuff would you need to conduct a spraying operation from miles above the earth that would have any measurable effect on people? Such a massive amount of time, energy, and resources when it would probably be way more effective to put that stuff in our water. Here's a cool video that complements this topic, and it's from one of my favorite YouTube channels, "Smarter Every Day". Destin gives us a rundown of which colors are created by which compounds. If you haven't seen any of Destin's other work I highly recommend it. He's a rocket engineer at Redstone Arsenal in Georgia and is probably most well known for being, "that guy who stuck a camera to a chicken's head to show how they have a sort of natural motion stabilization thing going on". Another vid about the chemistry in fireworks. As a US citizen and resident of Ireland yesterday was very frustrating, no backyard fireworks! Also didn't get invited to the Ambassador's party in Phoenix park yet again (well, that is understandable). I used to drive 200 miles roundtrip to Wyoming to get my fireworks fix. Now I can go to Ulster but they only sell fireworks in October (BTW, British fireworks are a lot better the lame stuff they sell in the US). So had to settle for putting on a craic for the neighbors with traditional American BBQ fare. These days, most of the world's lithium supply comes from mines in Bolivia and northern Chile. Not surprisingly, there is a high level of lithium in well water, which is what most of the locals drink. Although I haven't been there, a friend of mine goes to Bolivia every summer and reports a great deal of personal happiness among the Bolivians despite that country's serious poverty. My friend loves it there, and wishes she could stay there permanently, but work keeps her bound to a desk in the USA most of the time. I've pointed out many times to believers that chemical elements found in soil and rain tests can come from sources such as fireworks. Thanks for making this thread, Mick. Any topic that gets pointed out several times deserves a dedicated thread. That way you can just point, or cut and paste. It takes a lot more time to make a nice concise debunking thread, but ultimately it saves time, as the effort is greatly magnified - not only from you not having to re-make the argument, but also because the info can now be independently found and shared by others. I do not know if this has been covered elsewhere but I thought it relevant to put somethimg here with the mention of "nanoparticles" of Aluminium. Chemtrail sites such as Global Skywatch make an issue of a study done by the USAF In Vitro Toxicity of Aluminum Nanoparticles In Rat Alveolar Macrophages The study essentially exposed rat alveoli to various doses of "nano" aluminium oxide particles. They reached the following conclusion. viability, aluminum nanoparticles appear to be slightly toxic to rat alveolar macrophages. So what we see is that alveoli function was reduced at the lowest level of dose of 5 ug/ml which equates to 5 g/m3 and that in general is a bad thing. Pulmonary Fibrosis in Workers Exposed to Finely Powdered Aluminium published in 1961. The study was an examination of a number of case histories for men working in a factory making the fine aluminium powder for fireworks and notes the incidence of pulmonary fibrosis. Of 30 workmen at risk 27 were examined and six found to have evidence of pulmonary fibrosis. Inhalable dust is dust of 100 um and respirable dust is of 10 um or less and the figures are exposure limits in mg/m3 over an 8 hour period. So in the case of Aluminium oxide the dangerous fraction is respirable dust at 4 mg/m3. So to put that in context that is over a thousand time less than the USAF study. The point of post, apart from the study link to fireworks, is to highlight that studies have been done for decades with regards to Aluminium oxide dusts, hence the Working Exposure Limits. For the casual visitor when presented with information that breathing in dust can do harm, which it can, it goods to reference what levels the HSE or OSHA state against what a chemtrail researcher presents. After all we live in a litigious society and there are many groups more than ready to take a court case on if it can be shown aluminium compounds are present in excess of safe levels. After all we live in a litigious society and there are many groups more than ready to take a court case on if it can be shown aluminium compounds are present in excess of safe levels. And those workplaces probably have monitoring systems in place. While the levels would automatically be a tad higher than average, they would certainly have noticed if there were dangerous amounts. And I think it's important in discussion like this not to give the impression that we are arguing "the detected levels of aluminum are safe", as that can be mistaken as implying that there's actually some spraying going on. The point that is being made here is that aluminum, barium, and strontium are found in the environment from various sources, so finding some an expected occurrence, and does not indicate anything. (BTW, British fireworks are a lot better the lame stuff they sell in the US). Put to shame by some Canarian displays I've seen. They blow themselves up quite frequently here, they're so keen. For whatever it's worth, I've had lots of exposure to fireworks, and ditto for most of the locals here in Taiwan. Sadly, it's kind of dying out. Our present government thinks it presents a bad image of Taiwan. Isn't "modern," might give foreigners a bad impression, blah blah. Funny, that most foreigners I know love it, and some even come to Taiwan to see it. But soon it will just be history. But soon it will just be history. LOL I did want to rate the video you posted and I do like that TV show every now and then, but there is no idiot or idiots button to rate the video(note:not for you or your comment, just the vdieo). Looks like "safety 3rd"(said with an Irish accent), a joke a few of us make who build stuff for the Burning Man festivals around the planet. But it is only a joke "safety 3rd" with us and we are very careful about how we burn and drop our installations. Here is a funny little video of my favorite 12m high Australian Effigy we have built so far and burnt, I wasn't sure if I should have posted this, but as I do use a picture of this for my profile, so I didn't see any harm in sharing some more of my art. This is only a short video of this and not one of the ones with the head and arms moving while we were blowing LPG/propane flames out of them. The Burns around the world also have great fire works displays. (Doesn't "translate" well in print...needs to be aural..). The mayor of the town where I live, Taitung, wants to kill the Lantern Festival. 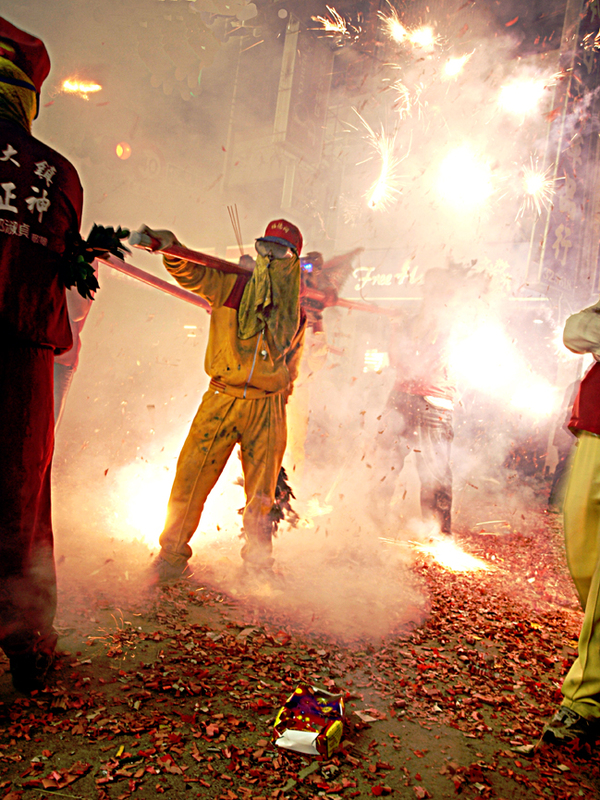 However, the town of Yanshui is determined to keep the tradition alive (at least so far). Good video of the Yanshui Lantern Festival (really gets cooking towards the end), and handily disproves the claim of our stupid mayor that "foreigners don't like the Lantern Festival"
I'll put it on my bucket list. But need a good tour company that takes you to all the pyrotechnic action. Some really scary chemworks there. He had a small live-in workshop which was essentially covered in aluminum sanding dust...and so was his hands, face, and probably lungs. Anything "dusty" or "smokey" is a bad thing for your health. But, some people get sick, and some don't.. Just like not all smokers get cancer. My dad used to work as a carpenter in a woodworking environment, with big machines blowing saw dust everywhere. These were the days that dust extractors were science fiction.. My dad was during his working life often sick by the effects of dust.. Had to use inhalers and such. But, he is still around (76) and no lung problems at all. 20,000 tons may seem like a lot but next to the 2.8m tons of fuel consumed daily by the US alone its merely a drop in the bucket comparing volume. If there were (are) genuine concerns about barium, aluminum, strontium.......... why are low altitude fireworks rarely mentioned ? One could claim that these "firework dispersals" are a rare event....once or twice a year, and dispersed by wind. Can you explain why you think Lithium is used in fireworks? What evidence do you have for this? There may be badly researched websites out there saying it is. So really, the question is why would you think it's not? If you read the articles, they are not by firework experts, one is by a Junior at Yale who: 'Likes to write about Science'. But probably gets a lot of stuff wrong. The other one says the display for the Clintons 'MAY have used salts like Lithium'(!) I worked in the firework industry for many years and Lithium was unheard of (even if it does produce a pink flame in the lab) The other article says that the US Army is experimenting with a NEW non-toxic flare (January 2018!) Probably not in production and use yet then? If Lithium is new and experimental in Jan 2018 in the US Army, then it's almost certainly NOT in use in pyrotechnics OR fireworks since fireworks borrows tech from military. The US army will know nothing about fireworks, but quite a bit about flares. I have an extensive literature of dozens of books and periodicals on fireworks going back 80 years. 'Fireworks-Principles and practice' Lancaster 1972 mentions Lithium once: 'It's high price precludes it's use' 'Chemistry Of Powder And Explosives' Davis, 1942 makes no mention of it in his chapter on Fireworks. 'A History Of Fireworks' - Brock 1949 makes no mention of Lithium, only Strontium. 'Military and Civilian Pyrotechnics' Ellen 1968. says that Lithium is 'more hygroscopic even than Sodium salts' precluding it's practical use in pyrotechnics. His chapter on fireworks does not mention it once. 'Fireworks - The Art Science and technique' Takao Shimizu PHD 1981 does not mention lithium once but states that red stars are produced by the strontium salts, nitrate, carbonate and oxalate. 'Fireworks- A History and Celebration', Plimpton 1984 makes no reference to Lithium at all. 'Pyrotechnics'-Weingart 1947, Makes no mention of any Lithium salts, but makes extensive reference to strontium for red. 'Zambell The first family of fireworks' makes no mention of Lithium at all only strontium. No one ever used it in any of the factories I worked at. I've not seen any reference to lithium in any of the amateur literature either. As Mick said there are hundreds of sources. Lithium - Lithium is a metal that is used to impart a red color to fireworks. Lithium carbonate, in particular, is a common colorant. The color chart Mick referenced above is from Prof. Bassam Z. Shakhashiri, who is a professor of Chemistry at the University of Wisconsin-Madison. I have an extensive literature of dozens of books and periodicals on fireworks going back 80 years. 'Fireworks-Principles and practice' Lancaster 1972 mentions Lithium once: 'It's high price precludes it's use' 'Chemistry Of Powder And Explosives' Davis, 1942 makes no mention of it in his chapter on Fireworks. 'A History Of Fireworks' - Brock 1949 makes no mention of Lithium, only Strontium. 'Military and Civilian Pyrotechnics' Ellen 1968. says that Lithium is 'more hygroscopic even than Sodium salts' precluding it's practical use in pyrotechnics. His chapter on fireworks does not mention it once. 'Fireworks - The Art Science and technique' Takao Shimizu PHD 1981 does not mention lithium once but states that red stars are produced by the strontium salts, nitrate, carbonate and oxalate. 'Fireworks- A History and Celebration', Plimpton 1984 makes no reference to Lithium at all. 'Pyrotechnics'-Weingart 1947, Makes no mention of any Lithium salts, but makes extensive reference to strontium for red. 'Zambell The first family of fireworks' makes no mention of Lithium at all only strontium. If Lithium is new and experimental in Jan 2018 in the US Army, then it's almost certainly NOT in use in pyrotechnics OR fireworks since fireworks borrows tech from military. There are numerous other mention over the past 100 years. So there's a few points there - hygroscopicity is a problem for an oxidizer, and it's "usually" avoided, but high hygroscopicity materials can be used with appropriate measures. Then we have Russell's The Chemistry of Fireworks, Royal Chemical Society (2000), which mentions Lithium in the index, but there's no online access to the page. "Rarely used" means that it is used sometimes. So I'd say multiple sources over 100 years is very strong evidence.